PrintBot is a real sweetie because he’s helped us launch a new product to our vast range of printed items; printed rock sweets! 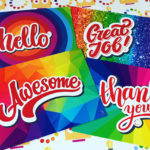 Not only are they a funky giveaway for your reception area, event or exhibitions but, the wrappers are biodegradable and the sweets are vegan-friendly too! What a treat? Samples of our own printed rock sweets will be included in delivery packs for all our customer orders because…THEY ROCK! If you would like to know more information, call 01332 418377 or email printangels@essentialprintservices.co.uk.